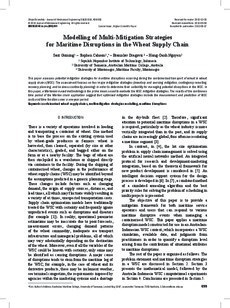 This paper assesses potential mitigation strategies for maritime disruptions occurring during the containerised transport of wheat in wheat supply chains (WSC). The assessment focuses on four major mitigation strategies (inventory and sourcing mitigation, contingency rerouting, recovery planning, and business continuity planning) in order to determine their suitability for managing potential disruptions in the WSC. In this paper, a Markovian-based methodology is the prime means used to evaluate the WSC mitigation strategies. The results of the continuous time period of the Markov chain application suggest that optimised mitigation strategies include the measurement and prediction of WSC costs and time functions over a one-year period.